Some people are born to write. Their words magically flow off the screen or page and you instantly feel like you are sitting across the table from a dear friend at Starbucks as they tell you about their latest adventure. Mary T. Wagner is one of those writers. Her resume is impressive. She is a mother of 4, former journalist turned prosecuting attorney, blogger and author of 3 award winning books. She has a way of capturing ordinary moments from life that are both effortlessly thought-provoking and funny. 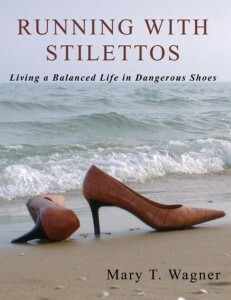 Running With Stilettos: Living A Balanced Life In Dangerous Shoes. Remember, you don’t have to have an actual Kindle to take advantage of this offer. Amazon offers many free app downloads to read Kindle books on your PC or other device. I recently had the chance to ask the delightful Mary Wagner a few questions. Let’s start this interview by cutting straight to the chase. Have you ever actually run in stilettos? Mary Wagner – Only for the elevator and the bus. Sticking with the shoe theme for a moment longer, I read that you started wearing stilettos at, let’s say, a more mature age than the average. How did you ever get used to them? Mary Wagner – Positive reinforcement went a long way! As I mention in the Foreword to “Running with Stilettos,” I bought that first pair on a whim as a reward for getting through some uncertain and challenging times. And when I wore them to work the next day, they drew some favorable comments… and stares. And of course, anything that makes me look taller and thinner… well, that’s worth putting up with the challenge. How do you find the time to prosecute the bad guys, have a busy personal life complete with adult children and pets, learn how to operate a chainsaw, and still manage to find the time to be the author of 3 award winning books? Mary Wagner – Chocolate addiction figures heavily into the equation. I almost never cook, and my house could be a national shrine to clutter. Plus, I don’t find nearly enough time to exercise… which is why I’m carrying around a few more pounds than I’d like. And I freely admit to falling short on keeping in touch with old friends. I still haven’t sent out my 2012 Christmas cards. I hope to get them out before Valentine’s Day. Much of your writing is about your life. Do you ever struggle with how much to tell and how much to keep personal? Do your family members ever object to something you have written? Mary Wagner – I tend to stay positive and keep the most searing stuff private. I greatly admire Michael Perry’s writing (Population 485; Truck: A Love Story) because he wields an absolute scalpel when he’s writing about life and the people who surround him, warts and all. But I’d rather draw a screen on some things. For instance, you’ll find me writing about how much I love my children and the inspiration I derive from them, but not the occasional kitchen showdown from the past when they were teenagers where I may or may not have shouted the words “What the f— did you think you were doing?” at the top of my lungs. Really, my kids have been very encouraging and supportive about the writing I’ve done. My late godmother, on the other hand, thought that my writing was entirely “too confessional” and that I should write something else. You just can’t please everybody! Mary Wagner – It’s always been finding the time to do it. When I get home from the office, my brain is pretty well melted and useless in terms of creative thinking. Even on my days off, the laundry doesn’t do itself, nor have the cats figured out how to change the litter box. Do you have a favorite Essay in Running With Stilettos, and can you tell me a bit about it? Your first 3 books are a collection of essays, but I see on Amazon that you have ventured into fiction with 2 short stories. Can we expect to see more of that from you? Mary Wagner – Absolutely! Right now I’m working on re-publishing my three e-book essay collections as paperbacks through Amazon’s CreateSpace. That is a HUGE time-consuming formatting headache for me, I’m not tech-savvy at all. But after that project is finished in a few weeks, I’ve got two streams of fiction I want to follow. One is to get back to work on the suspense novel I started a few years ago but put on hold while I was dealing with serial family emergencies. And the other is to write a “young adult” novel…or two…or three, since that’s such an incredibly blossoming publishing market. I figure I can channel adolescent angst and feelings of alienation and “perpetual outsider” status with the best of them, since parts of my teenage years were hell. But I don’t think I’m going to include any vampires or werewolves! What are the challenges of self publishing? The rewards? Are you currently working on any new books? Mary Wagner – Oh, yes! One is a suspense novel featuring a gearhead female prosecutor with a juvenile delinquent past (she promises to be SO much more interesting than me!). And the other is a young adult novel whose story line is still percolating. But the main character’s backstory is already anchored in my head, and I really like her. What is one thing you really want to accomplish this year? 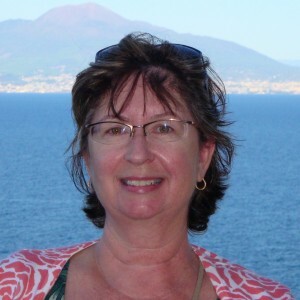 Mary Wagner – Finish one novel and start another. Though in my fondest dreams, this is also the year that some producer options “Running with Stilettos” for a film and gets Patricia Arquette to play a younger, prettier version of me. If you could go back in time and talk to your 20 year old self, what would you tell her? Mary Wagner – Oh, that question actually brought tears to my eyes! I would tell her that you don’t have to be perfect to be loved. That it’s okay to admit that you don’t have all the answers and to ask for help. And that sometimes, if other people seem on occasion to see better things in you than you see in yourself… believe them. Marlo Thomas: It Ain't Over! 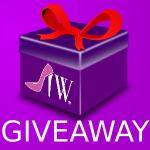 Interview & Signed Book Giveaway. Mary, I am so happy I read this interview. You sound like an author that I’ll enjoy reading. Oh and thanks for not including vampires and werewolves in any of your writings! I am a book sucker so I’ll definitely be downloading! BH – I know you will love her books! I really enjoyed reading her work. I love to find new authors. Thanks for sharing! I’m always looking for new books to read, so thank you for this review! Great interview. Love to read and am always looking for great books. I love to read and this looks so interesting. Her honesty is right out there, chocolate, a little clutter, and the late Christmas cards. 🙂 I hope she keeps in touch with IW. Great interview. Thank you for sharing. Great interview – I think I will like this author! (I already like her “voice” from the interview.) I just got a Kindle Fire for Christmas so this is perfect timing! I love this interview. An author that sounds like a real person w/a chocolate addiction. Really, I can’t imagine when she finds the time to write. I’m looking forward to downloading her book! Wow, what a lovely introduction to a person and author I’m looking forward to getting to know better. I want to read ‘The Devil on Horseback’ first. Thank you, PP and thanks to Mary for the free download this weekend! Loved the interview and I am looking so forward to reading the book. I will be downloading it and passing it on to my friends. I love chocolate too. I also took the easy way out this year and did mostly Ecards for Christmas. Welcome Mary from a fellow Wisconsinite to our little corner of the net. Loved reading the interview!! Will download the book tomorrow for sure! One of my favorite authors is Nora Ephron (I Feel Bad About My Neck) and partially because she is so real and authentic. Ms. Wagner sounds like she could be like that as well and that is so much what I want to spend time reading! Thanks for the great interview! Ladies, thank you for such a warm welcome!! Seriously, as soon as I came across this website’s name, I felt like I’d found my “home planet.” Enjoy the book! Great interview! I’m always in the market for new books. I downloaded the book & I’m looking forward to reading it. I’m with the others (and especially Mo) I love love love finding new authors!!! I can’t wait to dig in to this one. Great Interview! I can’t wait to read this. Yay! I downloaded this today. Can’t wait to start reading it.